After the extinction of the non-avian dinosaurs about 65 million years ago, the terror birds were the closest the world has ever come to seeing the imposing, predatory “raptors” of the Mesozoic return. One of the most recently-described species, the approximately 15 million year old Kelenken guillermoi, was a roughly ten-foot-tall carnivore with a two-foot skull tipped in a long beak well-suited to tearing flesh. Not every species grew quite so large, but, as a whole, these flightless, hatchet-headed avians came in a variety of sizes and were among the chief predators in prehistoric South America before the coalescence of the Panama land bridge allowed the formidable dogs, bears, and cats of the north to extend their reach. But this peculiar group of birds – technically known as phorusrhacids – was not wholly left in “splendid isolation.” At least one branch of the terror bird family tree, the appropriately-named Titanis, made it northward to stalk the grasslands of prehistoric Texas and Florida, and now a new paper suggests that these imposing birds gained a toe-hold in Africa, as well. According to the new research published by Cécile Mourer-Chauviré, Rodolphe Tabuce, M’hammed Mahboubi, Mohammed Adaci, and Mustapha Bensalah, very little is known about Africa’s fossil birds between 65 and to 48 million years ago. Part of this has to do with the rarity of bird remains. Birds are lightly built and their hollow bones are easily destroyed by the various processes which affect a body between the time of the animal’s death and when the bones are found. Add the difficulty of finding appropriate deposits where such bones might be turned up and the fact that someone actually has to go looking for them, and it’s not altogether surprising that there is much we still have to learn about the birds which flourished in the wake of the end-Cretaceous mass extinction. At first glance, the new avian fossil Mourer-Chauviré and colleagues describe might not seem to add much to the overall picture of avian evolution in Africa. The specimen is little more than a nearly-complete right femur found in the roughly 48 million years old rock of western Algeria. In the context of what has been found before, though, the fossil is significant in that it’s from a land-dwelling bird. Many of the other fossil birds found in Africa were birds which lived along the prehistoric shoreline, and the new species from the Gour Lazib site represents the oldest terrestrial bird yet found on the continent. The suggestion that the bone might have belonged to a terror bird only sweetens the fossil find. 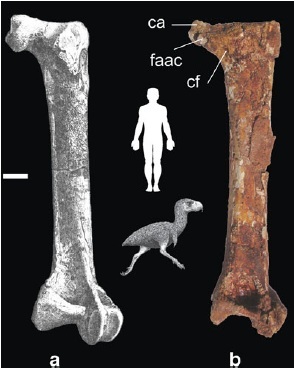 The right femur of Lavocatavis (right) compared with the femur of the South American terror bird Patagornis (left). The restoration in the middle depicts Andalgalornis steulleti, which is a stand-in for how large Lavocatavis may have been. From Mourer-Chauviré et al., 2011. The recently-discovered bird is different enough from what has been found before to deserve its own name – Lavocatavis africana – but what makes it a terror bird? That comes down to the constellation of anatomical peculiarities on the femur. The flattened nature of the rear face of the bone shaft, the orientation of several knobs associated with muscle attachment, and the size of several other landmarks all appear to be consistent with the idea that Lavocatavis was a terror bird that – when fully restored – could have looked an average-sized human adult in the eye. Mourer-Chauviré and co-authors compare the femur of the new bird with that of the genus Patagornis from Argentina, in particular, and the two look quite similar in overall shape and the distribution of features thought to unite the ancient predators. 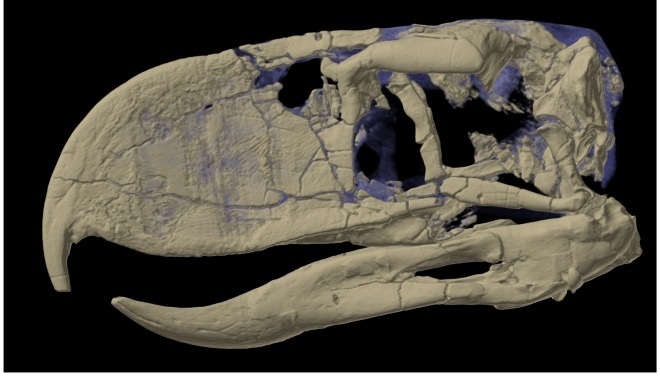 Should additional bones of Lavocatavis turn up – and I hope they do – the fossils will act as a test of the hypothesis that this creature was a terror bird. For now, though, let’s assume that the bird truly does represent a previously unknown branch of a group which primarily resided in South America and only arrived in North America after the constant dance of the continents brought the two massive partners together. How could a group which originated and radiated in South America make it all the way over to prehistoric Africa? Even though South America and Africa were once joined in the supercontinent of Gondwana – a truth still visible in the coastlines of both continents today – the two landmasses were already separated by the time Lavocatavis evolved. The split which would sunder the continents from each other began over 130 million years ago, before the terror birds had originated and dinosaurs still ruled, and therefore the idea that the opening of the South Atlantic ocean isolated a group of terror birds in Africa can be ruled out. Instead, Mourer-Chauviré and co-authors propose two different scenarios. Maybe Lavocatavis was an example of convergent evolution within the terror birds. Even though the big, specialized terror birds were flightless, their ancestors could fly. Perhaps some of the earliest terror birds – placed within a subgroup called the Psilopterinae – could fly, too, and if this is true then an early offshoot of the terror birds may have flown to Africa and evolved in more or less the same way as those which remained in South America. This is a bit of a stretch, though. If the ancestors of Lavocatavis split off so early, when the terror birds were still capable of flight, why would the femur of the newly-discovered bird have been modified in almost exactly the same way as South American forms such as Patagornis? Were the evolutionary pressures which gradually molded the anatomy of the terror birds on both continents so similar that evolution repeated itself? That two separate lineages of the same group should so closely converge requires a long string of additional evidence – the forerunners of Lavocatavis, for starters – and cannot be taken for granted. The other possibility is that the precursors of Lavocatavis arrived in Africa by rafting across the prehistoric Atlantic. Though it might seem silly to think of a terror bird set adrift on the ancient seas, such events are known to have happened – the New World monkeys of South America, for example, arrived on that continent because of a prehistoric, transatlantic voyage from east to west. Maybe the terror birds went the other way. Prior to 48 million years ago, the northeast portion of South America was significantly closer to Africa than it is today – a little more than 620 miles at the shortest point – and it is not inconceivable that the caprices of oceanic travel brought terror birds to Africa (or at least close enough to island chains that the birds “island hopped” the final stretch of the trip). Unfortunately, the islands which might have allowed terror birds to reach Africa are underwater today and out of reach of paleontologists. Of course, these scenarios are only relevant if further discoveries confirm Lavocatavis as a terror bird. As ever, we need more bones. Not only do we require a better look at what Lavocatavis was like, but, hopefully, further searches of Africa’s fossil record will help test the ideas of when and how terror birds arrived on the continent. If Lavocatavis was the product of convergent evolution then we should expect to find older, more archaic terror birds in more ancient strata, and if the already-flightless ancestors of the bird arrived via an oceanic journey then specialized terror birds should appear relatively abruptly in deposits representing the prehistoric coast of western Africa. The deep history of Africa’s terror birds is, as yet, a mystery that has only just been uncovered.